This story concerns a group of physics students trapped in a cave. Although there is a dog in this story, the main animal here is a philosophical one—Schrödinger's cat, a very important creature to us quantum physicists. This is the most theoretical physics infested story that I've ever written. Indeed, I hid some new physics in the story, with the intent of citing the story in a physics journal article. I've yet to do that, though. The story appeared in Asimov's SF magazine's September, 2006 issue. The leonid meteor shower happens each year in mid-November. Some years, it hasn't been so much a shower as a storm. One year, I think it was 2002, I observed the leonids in a dark field near Cornell University. It was a great storm that year. It felt like the end of the world as white streaks brightened the sky. Occasionally, bolides, exploding meteors went off like strobe-lights. Although the field was well populated (for upstate NY) no one spoke above a whisper. We watched for the most part in silent awe. It was horribly cold and, unlike some of the college kids who'd brought sleeping bags to stand in, I was very underdressed. Every so often, I had to run to my car to thaw. I could have, of course, viewed the storm through the car windows, but would have lost much of the experience. So I mostly froze. 'Leonid Skies' was inspired by the storm. In the story, a distant father re-connects with his son in a huge, domed campground which is also a planetarium. The tale delves the power of the real versus the synthetic. 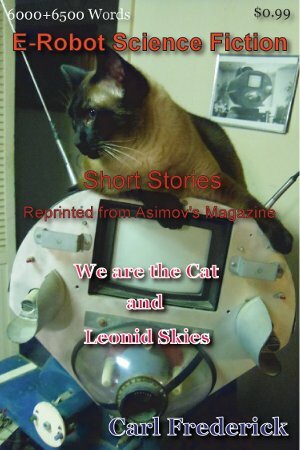 Published in the Oct/Nov issue of Asimov's Magazine.